Borobudur temple is the largest temple relic Century 9. This temple looks so impressive and sturdy so famous throughout the world. 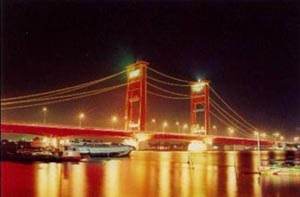 Heritage of this high value could be one of the seven wonders of the world. But did you know that as well as in other ancient buildings, the Borobudur Temple did not escape from the mystery of how the manufacture of Borobudur temple? This mystery is a lot of speculative opinion gave birth to controversy. With some notes and references are limited, I try to analyze and uncover the veil of mystery-making little Borobudur temple is that it does not need to be a mystery! Borobudur has a basic structure punden staircase, with a six-yard square, three circular courtyard and a main stupa as a peak. Also scattered in all pelatarannya several stupas. Borobudur temple built on a hill or a row of small hills that extends to the West-Southwest and East-Southeast to ± 123 m length, width and height of ± 123 m ± 34.5 m measured from the surface of the flat land around it to the top a flat hill. Borobudur Temple also looks quite complex views of the parts are built. Consisting of 10 levels where levels 1-6 and the rest rounded square shaped. The temple walls are filled with the image as much as 1460 relief panels. There are 504 statues that complement the temple. Soil core that serves as the foundation soil or soil foundation Borobudur temple is divided into two, namely the original soil and soil-forming urug hill. Urug land is land that deliberately for the purpose of construction of the Borobudur Temple, adapted to the shape of the temple. According to the Land Sampurno was added above the original soil as filler and shaper morphology of the temple. Urug land has been created by the founder of the Borobudur temple, not a result of restoration work. Urug soil thickness is not uniform even though located on the same floor, which is between 0.5 to 8.5 m.
Constituent rock type Borobudur andesite with high porosity, pores levels about 32% -46%, and between the pore holes with one another are not related. Strong compressive relatively low when compared with similar compressive strength of rock. From the research results Sampurno (1969), obtained a minimum compressive strength of 111 kg/cm2 and the maximum compressive strength of 281 kg/cm2. Heavy volume of rock between 1.6 to 2 t/m3. Data on this temple both in terms of design, history and philosophy of building so many available. Many historians and ancient buildings privilege to write about this temple. Search result data either in books or the Internet, none of which revealed little about the mystery of how the construction of the temple. The only information is written about the figure of Edward Leedskalnin strange and mysterious. He said "I have discovered the secrets of the pyramids and how people of ancient Egypt, Peru, Yucatan and Asia (Borobudur temple) lift stones weighing tons with only primitive tools." Edward is the man who built the famous Coral Castle. Some people then figure out how he's working to unravel the mystery about her knowledge of how the ancient building was built. Here are the opinion of some people and experts on how to build Coral Castle Edward: 1. Some say that he may have managed to find the secrets of the ancient architects who built the pyramids and monuments such as Stonehenge. 2. Some say maybe Edward using some sort of anti-gravity equipment to build Coral Castle. 3. David Hatcher Childress, author of anty Gravity And The World Grid, has an interesting theory. According to the South Florida area are home to Coral Castle has strong diamagnetik that can make an object float. Moreover, the south Florida area is still considered as part of the Bermuda triangle. David believes that Edward Leedskalnin using the principle of earth diamagnetik nets which enable large raised stone by using the center of mass. David also refers to the book notes that Edward found that indeed show the existence of schemes of magnetic and electrical experiments in it. Although the statement of David smelled of science, but the esoteric principles are still clearly visible in it. 4. Another writer named Ray Stoner, also supports this theory. He even believes that Edward moved to Coral Castle Homestead because he is aware of the mathematical calculation errors in determining the location of Coral Castle. So he moved to the area you have an advantage in terms of magnetic force. Finally managed to get photos taken at Coral Castle Edward did indicate that he is using the same method used by modern workers, using a principle called block and tackle. Different Coral Castle Borobudur Temple also different. Coral Castle still would allow using a Block and Tackle. For the Borobudur temple blocks and tackles it's still not there. So how exactly do I create this temple?. Mystery that has not been revealed based on the information above. I try to start thinking again regardless of the mystery by trying to analyze existing data. there are several aspects to consider before estimating how the temple was built, namely: 1. Shape of the building. The temple is square-shaped footprint ± 123 m in length, width and height of ± 123 m ± 42 m. Area of ​​15,129 m2. 2. The volume of primary material. The main material of this temple is the rock andesite berporositas with high specific gravity from 1.6 to 2.0 t/m3. It is estimated there are 55,000 m3 of rock forming the temple, or about 2 million rocks with rocks the size range 25 x 10 x 15 cm. Weight per piece of stone about 7.5 - 10 kg. 3. Construction of buildings. 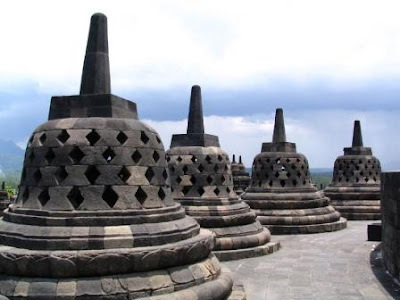 Borobudur Temple is a pile of stones placed on the mound as the core, so it is not a massive pile of rocks. Soil core also deliberately staircase-steps and the top flattened to lay a rock temple. 4. Each stone spliced ​​without using cement or adhesive. These stones are simply spliced ​​based on the pattern and stacked. 5. All the stones were taken from the river around Borobudur temple. 6. Borobudur Temple is a complex of buildings seen from the parts are built. Consisting of 10 levels where levels 1-6 and the rest rounded square shaped. The temple walls are filled with the image as much as 1460 relief panels. There are 505 statues that complement the temple. 7. Technology available. At that time there has been no transfer of technology and lift heavy material is adequate. Estimated using a simple mechanical method. 8. Estimated implementation time period. No information is accurate. However, some sources say that Borobudur temple built from 824 m - 847 m. There are other references that mention that the temple was built from 750 m to 842 m or 92 years. 9. Construction of temples carried out gradually. Initially built-storey apartment layout. It seems designed as a pyramid staircase. But later changed. As there is evidence that demolished apartment layout. The second phase, the foundation borobudur widened, plus two square steps and one step directly circle given huge main stupa. The third stage, steps on the circle with a large main stupa dismantled and removed and replaced three railroad circles. Stupas built on top of these steps with a large stupa in tengahnya.tahap fourth, there are small changes, ie, making changes to the relief of ladder and making arch above the door. 10. One thing that is unique, that this temple was architecturally appealing format or structured mathematics. Each bagain legs, body and head of the temple always has a ratio of 4:6:9. 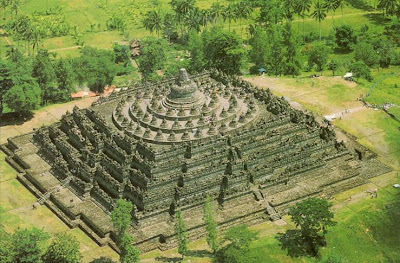 His Stûpa placements also has significance, plus more of the reliefs are estimated berkatian with astronomy makes Borobudur is a testament to the fascinating history observe. 11. The number of stupas at arupadhatu (stupa peak will not be considered) are: 32, 24, 26 which has a comparative basis, ie 4:3:2, and everything is divisible by 8. The size of the stupa at the three high TSB levels. Is: 1.9 m, 1.8 m, respectively bebeda 10 cm. So is the diameter of these stupas, have exactly the same size it is with height: 1.9 m, 1.8 m, 1.7 m. 12. Some numbers in Borobudur, when added up the numbers will end up being number 1 again. Suspected that it was made so that can be interpreted: The number 1 symbolizes the Oneness of the Adhi-buddha. The number of levels of Borobudur is 10, the numbers in 10 when added together the result: 1 + 0 = 1. The number of stupas in arupadhatu in which there are statues: 32 + 24 + 16 + 1 = 73, number 73 when added together the result: 10 and as above 1 + 0 = 10. The number of statues in the Borobudur total of 505 pieces. When the figures in it are summed, the result is 5 + 0 + 5 = 10 as well as above 1 + 0 = 1. look at the data above, would still be expected, I try to give some analysis that hopefully can be commented upon as we attempt to uncover the mystery that is as follows: 1. of the existing data is mentioned that the size of the stone temple is about 25 x 10 x 15 cm with a specific gravity of stone is 1.6 to 2 ton/m3, this means the weight per piece of stone is only about a maximum of 7.5 kg (for severe type 2 t/m3 ). The piece was very soft stone. For heavy as it rocks, it does not need any technology. Problems that may arise is sloping terrain that must be taken. Sloping field in physics to make the burden seems to be more severe. This is because the decomposition of the style of cause there are horizontal parallel to the slope of the load that must be borne. But with the fact that the weight per piece of stone is only 7.5 kg, it was an oblique field problem beundak the steps do not matter. The conclusion is the process of transporting pieces of stone can be done easily and does not need any technology. 2. source rock material taken from the river around the temple. This means that the distance between the quarry and the site is very close. Although the number reached two million pieces, but the lightness of the material of each piece of stone and proximity of transport, this means that the transport process can be done easily without the need for specific technologies. 3. temple was built in the time period long enough. Some say 23 years have also said 92 years. If you assume the fastest 23 years. Let us count the installation of stone about productivity. If the land preparation and early material is 2 years, then the installation of a stone is 21 years or 7665 days. There are 2 million pieces of stone. Productivity installation of the stone is a stone 2000000/7665 = 261 / day. Productivity is likely very small. No need any way to generate a small productivity. Moreover, using data execution duration is longer. 4. Borobudur temple is the length of the manufacturing process can be due to any design changes made during implementation. 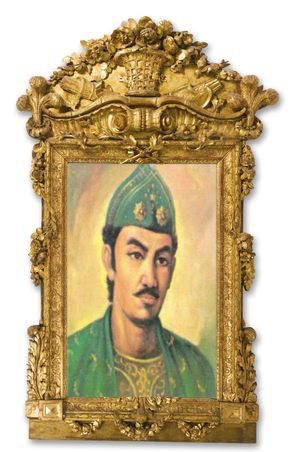 This may dikeranakan the turn of the ruler (king) during the construction of a temple. 5. Borobudur seen physically very impressive. Has 10 floors with square and circular shapes. Having reliefs along the walls and statues in large numbers. This temple is so concerned with the philosophy contained in the measures. This proves that the temple was built with the concept of design is quite good. 6. Borobudur temple is the largest temple. Borobudur temple complex is also seen seen from its architectural design consists of 10 levels where levels 1-6, square and round remaining. The temple walls are filled with the image as much as 1460 relief panels. There are 504 statues that complement the temple. This is clearly not the work of design and implementation easy. 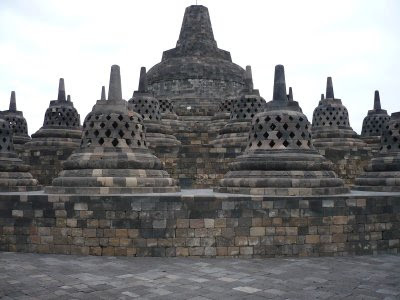 Borobudur temple is a valuable conclusion from both sides of the civil engineering design and the art of architecture requires careful planning and management aspects of the design and manner of implementation. I conclude this temple was built by the project management has been good enough.